The DR-G1100 / DR-G1130 comes out of the box with a host of highly stable and reliable features. Our patented Ultrasonic Double Feed and Staple Detection reduces feeding errors, while Rapid Recovery helps to remedy the rare situations when they occur. Solidly built for heavy duty work, the DR-G1100 / DR-G1130 just keeps going. Designed to tackle the heaviest of workloads, the DR-G1100 / DR-G1130 offers accelerated batch processing that is sure to please. 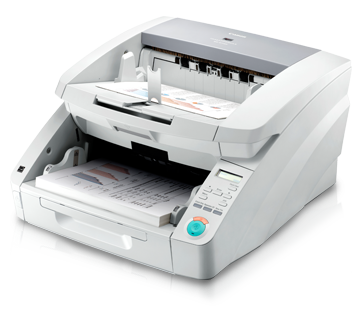 Automatic document conversion capabilities combined with an impressive 130 pages per minute scan speed makes it easy for you to complete your tasks quickly and efficiently. The DR-G1100 / DR-G1130 is made to make your job easier. The intuitive Control Panel and Job Key helps you to start and complete your tasks, while the Document Feed Tray adjusts itself to the height of the paper batch. All these features and more enable high volume, unattended batch scanning that frees you up to focus on other tasks.